Growth factors and cytokines released from damaged body tissues trigger circulating and resident stem cells to stimulate the repair of damaged tissues. Unfortunately, the efficacy of the stem cells has been observed to be compromised by the cytotoxic conditions and reduced homing on the target tissue. The compromised efficacy of stem cells leads to serious cells death during the first phase of transplantation. Therefore, a method that will help improve in vivo stem cell viability will be desirable to enhance cell-based treatments. The condition within the damaged tissues is unconducive for the survival of stem cells reference to inflammatory mediators, hypoxia, inadequate glucose, and oxidative stress, the latter being more damaging. Specifically, hydrogen peroxide, which diffuses freely in and out of cells is thought to be the major cause of necrosis and apoptosis of stem cells. However, the use of external oxidative stress in regulating the death of stem cells has been researched comprehensively in vitro. Previous research work was limited to the use of differentiated cells as opposed to stem cells and their scope is on events occurring a few minutes or up to 24 hours after treatment. It has been found from in vitro experiments of stem cells (based on comparative analyses of oxidative stress resistance among embryonic, mesenchymal, and induced pluripotent stem cells), that pluripotent stem cells as well as embryonic stem cells are not as resistant to oxidative stress as mesenchymal cells. Other related studies have however shown that oxidative stress initiates senescence in the mesenchymal stem cells. For this reason, there is still a need to sufficiently understand the effects of the exogenous oxidative stress on stem cell viability. Italian researchers led by Professor Fabiana Geraci from the University of Palermo conducted a study in a bid to understand why only a few stem cells survive after transplantation. In their studies they used severe oxidative stress conditions to select for a mouse mesoangioblast subpopulation. Their research work is published in peer-reviewed journal, Cell Death and Disease. The research team specifically incubated hydrogen peroxide to the cells to apply severe exogenous oxidative stress to mouse mesoangioblast perivascular myogenic progenitors in order to isolate resistant cells that survived after an extensive recovery period. The authors found that the mesoangioblast subpopulation retained self-renewal as well as myogenic differentiation capacities and improved cell survival, proliferation and migration relative to unselected cells. After oxidative stress treatment, the subpopulation exhibited varying recovery and resistance. This presented several advantages over the parental mesoangioblasts. The cells were resistant to oxidative environments with improved cell survival, continuous self-renewal, and better migration potential. 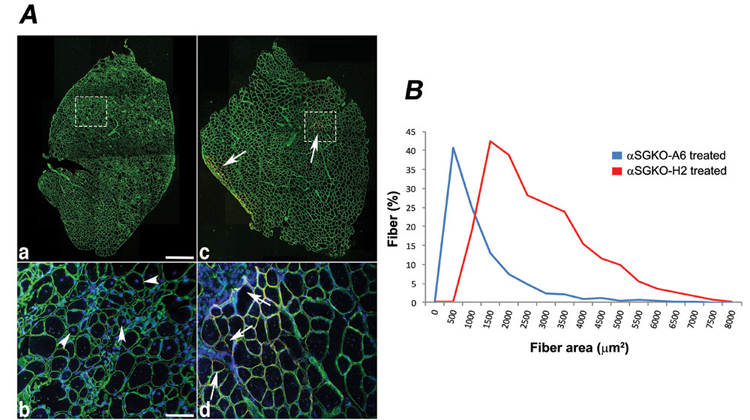 The authors also noticed that resistant mesoangioblasts exhibited improved survival as well as integration into the skeletal muscle of a mouse model of muscular dystrophy (alpha sarcoglycan null) and this accounted for more than 70% improvement in engraftment as opposed to that of unselected mesoangioblast cell (Figure 1A) and led to satisfactory muscle morphology recovery, also restoring alpha sarcoglycan expression (Figure 1B). The Italian study showed that sorting on mesoangioblast cell behavior in vivo and in vitro would imply that a selection phase entailing oxidative stress preconditioning could provide an attractive method of selecting resistant cells for application in regenerative tissue applications to reduce the high mortality rates after transplantation. Cesare Gargioli, Giuseppina Turturici, Maria M. Barreca, Walter Spinello, Claudia Fuoco, StefanoTesta, Salvatore Feo, Stefano M. Cannata, Giulio Cossu, Gabriella Sconzo and Fabiana Geraci. Oxidative stress preconditioning of mouse perivascular myogenic progenitors selects a subpopulation of cells with a distinct survival advantage in vitro and in vivo. Cell Death and Disease (2018) 9:1.